Do you have trees you want to turn into lumber? 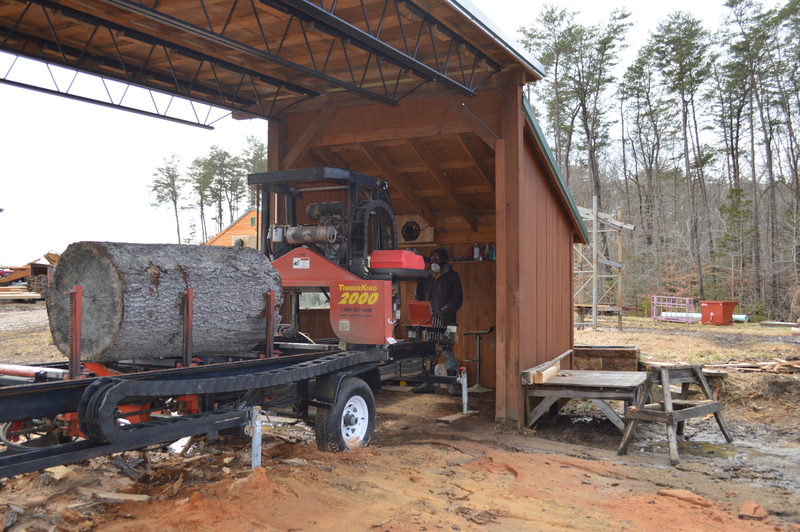 Knot Farm will be happy to turn your Logs to Lumber using the TimberKing 200. Once you contact one of our team members and photos have been sent we can determine if the wood you are looking to have milled is useable, then we start the process. If access to the area for photos is limited or nil, or log quality or yield is questionable, a site visit and evaluation is advised. There’s a $50 one time fee for the visit, however that cost will be deducted from the final milling bill. Getting the wood to the Sawmill. Hopefully you have a trailer and tractor to load up the logs, doesn’t everyone? If you don’t have heavy duty loading equipment we can arrange to pick your logs up. The cost will be determined by the size and amount of logs, you will be provided with a quote to clear and haul the logs from your property to Knot Farm. Saw milling generates 3 products. Finished dimensional lumber of varying sizes, slab wood and sawdust. Slab Wood- As we mill, the slab wood and waste will be carried to a pile to be disposed of latter. You are welcome to keep all of these pieces, some or none. Finished Lumber- When the Sawyer cuts your lumber it will be stickered with your information and stacked for drying after the sawing is completed. The slabs off the first log can be placed cut side up, thus creating a temporary deck to store the lumber before stacking to dry. Sawdust- The sawdust is discharged on the side opposite the log pile. This results in a lot of sawdust. A 20 foot long tarp can be placed on the ground to catch it if you wish to keep it for use as bedding. 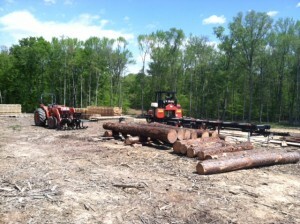 When the weather is perfect we want a light breeze blowing across the piled logs, across the mill and away from the operation. When the wind is wrong, strong or otherwise unruly, we will all be wearing dust masks and a lot of sawdust. Safety glasses and hearing protection is Required 100% of the time to be worn by anyone around our operation. What’s next for the Lumber? 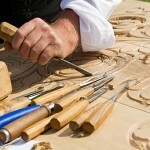 There are a few options for the newly Milled dimensional pieces. You can take them home to dry, you can keep them at Knot Farm to be stacked and dried and the final option is to have them Kiln dried in our state of the art ZERO emissions, solar powered kiln. Yes we think it’s pretty cool! After the wood is air dried you can have it further kiln dried. This will avoid any shrinkage of the wood and it can be used for many projects.